strikingly vivid world building and thrilling tension. Rich world building, a slow burning romance and gripping tension enliven Smith’s fantastical dream world as a poor girl born to the tunnels beneath Barstadt works to rise above her caste. Livia’s life was not her own. She belonged to a gang who dictated her life. Only in her dreams did she feel the freedom she desperately longed for. When a Professor offers her a way out of that life, Livia seizes it, agreeing to spy for the government. 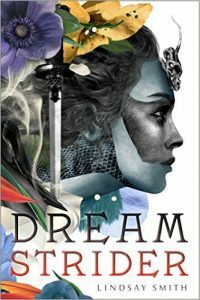 Her unique ability to dreamstride—slip her soul into a subject’s sleeping body and inhabit them in the waking world—helps her to gather critical intel. When the Barstadt Empire suspects an impending invasion, Livia and her partner Brandt’s missions become even more perilous. It’s dangerous to dreamstride, to move through the shared dreamworld of Oneiros. Your body’s tether can snap and propel you into the Wastes—a dark undertow where Nightmare devours. Dreams rule Barstadt’s culture, weaving through government and religion to establish the foundational belief system for everyone from tunnelers to aristocrats. Nightmare was a dark entity believed destroyed by Dreamer (spiritual guide of Barstadt), but as Livia moves through Oneiros, she senses dark things stir to life. As tension escalates and political machinations play out, Livia’s self doubt consumes and cripples her. She believes she’s not good enough for the Ministry, not a worthy vessel for her gift. In addition, her partner Brandt begins to pull away, inculcating the realization that she is in love with a man whom she can never be with. He’s an aristocrat who could never love, never be with, a former tunneler like herself. Suddenly, however, reality and dreams begin to blur as Nightmare seems to wake. While their enemy readies, Livia is forced to work with suspect people from another land and treacherous aristocrats work to bind Nightmare once again. Dreamstriding is more dangerous than ever and Livia must step up to the challenge and uncover who/what threatens to shatter both the dream and waking world. Smith’s story may not be for everyone—this is a high-concept story rife with intrigue and detail. I loved it though. I was so struck by the unusual, somewhat horrific and macabre world, and the striking juxtaposition of dreams and nightmares. It was as frightening as it was intriguing and alluring. Vivid, sharp and spellbinding. The espionage added the perfect amount of page-turning tension and suspense. But beyond the world building and the political intrigue, the story is really about a girl who struggles to believe in herself and her abilities, and what she must experience to embrace her past, present and the gifts she’s been given. It’s a wonderful story to get lost in.